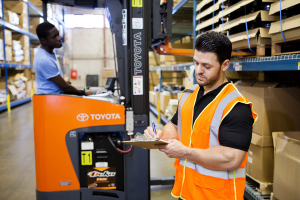 This course is designed for the individual with lift truck operator experience but has not had formal training. This program will be specifically geared to your application and equipment, and will enhance and revive your operators’ awareness of safe lift truck operation. Operators are given a written test and a hands-on evaluation. This course will provide the attendee with a Lift Truck Certificate upon successful completion of both theoretical and practical components. Included are certificates and wallet cards for each operator and all necessary paperwork for company records.